The entrance shaft sloped downward at a terrifying angle. I descended in a crouch, unsettled by a combination of vertigo and claustrophobia. Ahead, our four boys were chattering nervously as they half-walked, half-slid into the heart of the pyramid. They knew enough about ancient Egypt, Indiana Jones and Tomb Raider to know that this was a Really Big Adventure, something that few six and nine year olds would get the chance to do. “Thank you for taking us to Egypt and into the pyramids!” Logan shouted, his voice echoing in the gloom. “This is amazing!” Egypt hadn’t been on our original six month itinerary. But after two months exploring Thailand, Indonesia and the Philippines, we needed to get to Italy somehow. That’s when Nori found a reasonably priced flight on EgyptAir from Bangkok to Milan – with a stopover in Cairo. Could we pass up an opportunity for the boys to see the last of the Seven Wonders of the Ancient World still standing? Of course not! In 2004, as part of our 2.5 year “Honeymundo”, Nori and I spent three weeks in Egypt. We scuba dived in the Red Sea, explored the crumbling ruins of the Siwa Oasis, chilled on the corniche in Alexandria and visited Ancient Egyptian sites from Cairo to Luxor. This time we had just three days and four new travel buddies! Our overnight flight arrived at 6am We crashed for a few hours at the Amin, a basic but comfortable hotel near Tahrir Square. Nori had arranged a guide and driver for the next two days. Mona was waiting for us downstairs. She was friendly, knowledgeable and took a shine to the boys once she got over the initial shock at their energy levels. There are no benches in the Egyptian Museum; no place for tired soles to rest. So great are the discoveries, so numerous the exhibits that the cavernous building resembles a warehouse rather than a carefully curated display of one of the world’s greatest cultures. Very little appeared to have changed since our last visit, 14 years ago. The sarcophagi were still stacked four deep against the walls, the bizarre animal mummies were still falling apart, the colossi still crowded in the main halls, and King Tut’s golden death mask was still breathtaking. 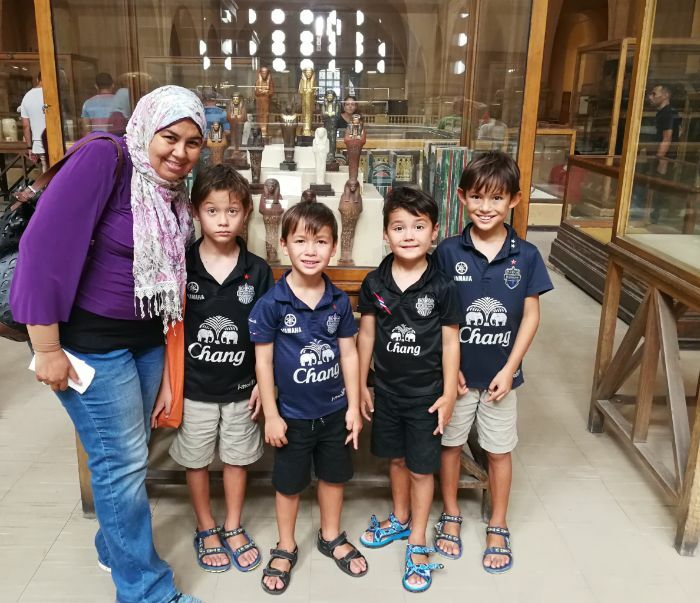 As much as I wanted the boys to enjoy the museum, I knew that the scale of the place and jet-lag would soon defeat them. So we had to hit the highlights fast. The gnarled, desiccated mummies were “supercreepy” according to Drake. Tai complained that he was going to have nightmares after seeing them. Logan kept wandering off. Kiva was stroppy. Knots of Indian and Chinese tourists made it difficult to keep track of our kids. After two hours, our feet were killing us. A new, much larger Grand Egyptian Museum is being built in Giza, near the pyramids. Due to complete by year end, the spectacular complex will house over 100,000 artefacts and provide a “21st Century resting place for King Tut”, complete with interactive exhibits,retail outlets, restaurants, conference centre and – hopefully – lots of benches. But not everyone was happy. 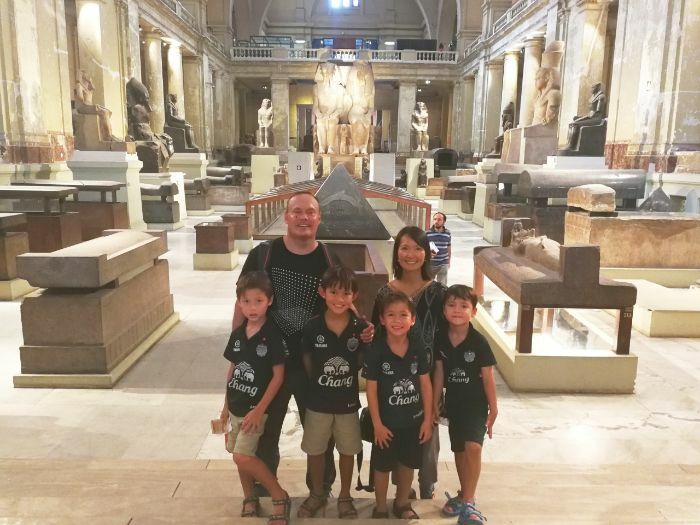 “My clients are already so tired after walking around the old Egyptian Museum for four hours! What am I going to do when the new museum is so much bigger? Are tourists going to try to see the pyramids and the new museum in one day?” Mona complained. 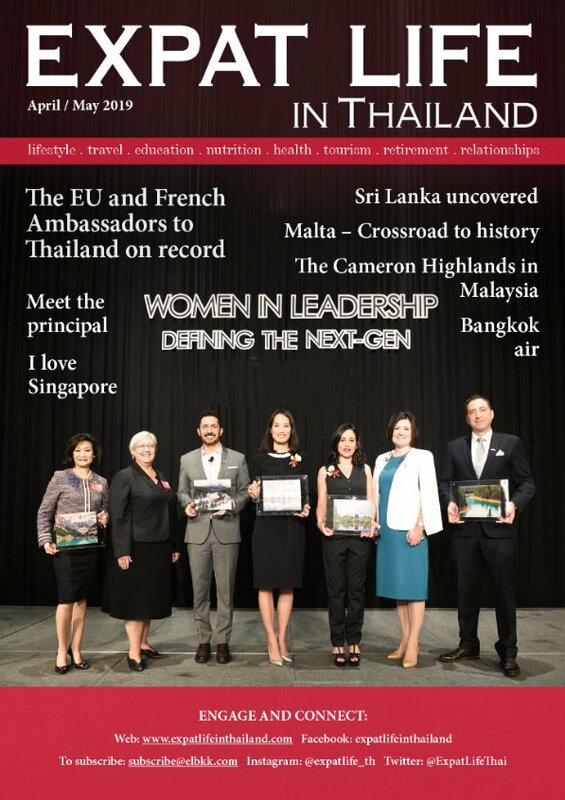 Our Italian friends in Bangkok had lived in Cairo for several years. To maximise our limited time in Egypt, they suggested we follow an itinerary that they cheekily called Il Giro Della Morte – “The Loop of Death” – an exhausting, full day circuit of multiple necropoles. After an early start the next morning, our first stop was the Dashur necropolis, 40km south of Cairo on the west bank of the Nile. Most tourists don’t make it here. But they should. The pyramids Sneferu built here nearly 5000 years ago illustrate – on a truly massive scale – how pyramid building technology advanced through trial and error from more primitive ‘step-sided’ structures to the mammoth masterpieces at Giza. Construction of the so called ‘Bent Pyramid’ at Dashur started at an overly ambitious slope of 54 degrees, then finished at 43 degrees. Sneferu’s next project, the so called ‘Red Pyramid’ for its russet-hued inner blocks, was a smooth-sided success. Sneferu’s son, Khufu, would go on to build the largest (and most famous) of the pyramids at Giza. Thanks Dad. Next, we returned towards Cairo and explored the Saqqara necropolis, which included the crumbling stepsided Pyramid of Djoser – the first pyramid built by the Egyptians – and dozens of smaller pyramids and tombs. The touts were as aggressive as I remembered them, putting necklaces over the boys’ heads and pressing postcard packs into their hands. While I was trying to get Logan to stop free-running on the monuments, two photo touts lifted Drake and Kiva atop mules and wrapped turbans around their heads. By the time we reached the Giza plateau, the six of us were hot, dusty and nearly pyramided-out. Spurning an expensive and cliched camel ride, we opted to walk to the pyramids and sphinx instead. Mona was adamant that the distances were too great, but we didn’t need to see everything. 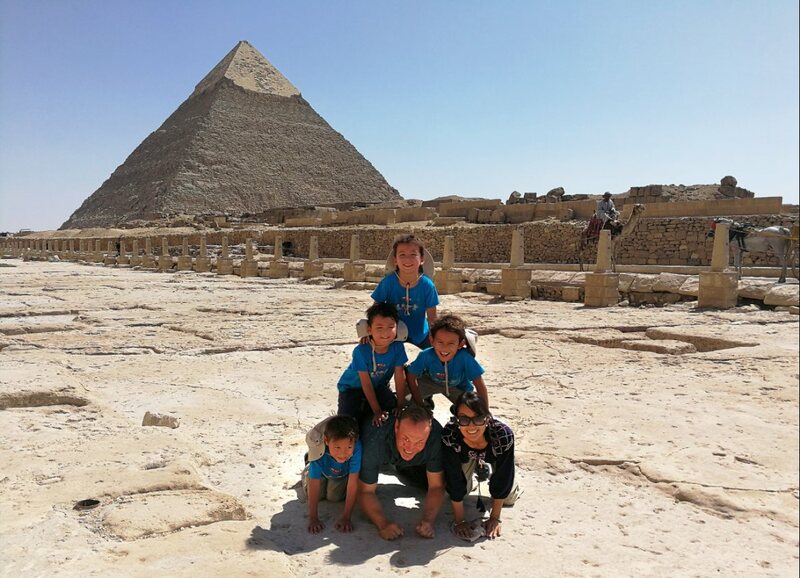 A short walk uphill from the ticket office brought us to Khufu’s Great Pyramid, where the boys had an incredible time climbing, running and jumping along the bottom five tiers. This was the place. We had practiced a few times in Bangkok and every day in Manila. I got down on my hands and knees on the gravel. Nori did the same on my left; Logan (the strongest), on the right. Tai climbed up and spread his weight between my shoulders and Nori’s. Drake, between my shoulders and Logan’s. Amidst groans and grunts from his brothers, Kiva (the lightest) clambered up to the pinnacle. Our family monument, the Pyramid of Kiva, was complete! What will our boys remember about The Big Twip? It isn’t easy to predict. Perhaps very little. Already ‘important’ details are slipping from their memories. Naturally, we tried to drum facts into their heads. Which countries have we already visited? Where did we see the dragons? In which city did we meet up with Dad’s college friend, Andrew? What is the capital of Italy? What do they call money in England? Are most Egyptians Christian or Muslim? But memorising capital cities and currencies isn’t really the point of long-term travel with young children. Ultimately, it’s about the time spent exploring the world together. I estimate that the six months I spent travelling with the boys (14 hr days!) was equivalent to 5-7 years of “normal” Dad time for me. For half a year, we were their teachers, counsellors, chefs, maids, drivers and doctors. It was exhausting! We hardly ever got to bed before midnight. But they were also some of the best months of our lives. The other major benefit of long-term travel with kids is what I like to call ‘impressions’ – memories that are less distinct but broader and more durable than facts or details. They might forget the name Cairo, at least for awhile. But they will always remember how the city looked. The names of the pharaohs (except for Tut) and pyramids were forgotten as soon as they were read. 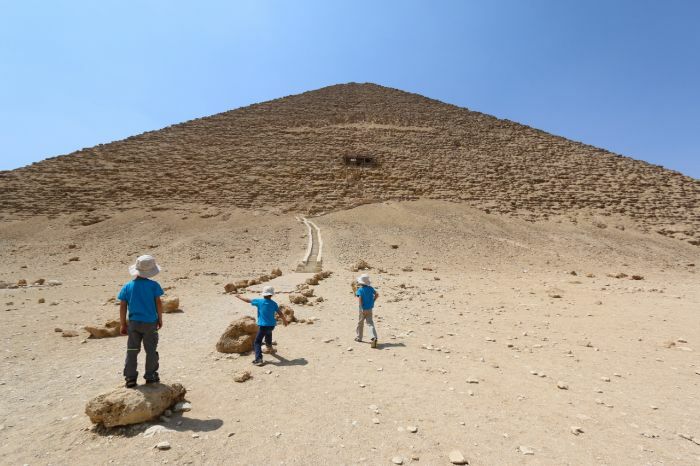 But the wonder of standing at the base of the Great Pyramid and looking up at that exquisite pile of giant stones, or the excitement of descending into Dashur’s Red Pyramid will stay with them for life.